Howdy! My name is Julia and I would like to offer you a warm welcome to my website. In fact, thanks for stopping by! I know the reason you’re here is because you’re looking for a new microwave, so let’s get started. What you should know is that I’m not an industry expert, so you won’t find lots of hard to understand reviews that detail all the technicalities on the models of oven I have here for you. But, you will get the facts you need to know (good or bad)! You see I started out looking for a new microwave because mine (after many years) reached the end of its shelf life. I spent a long time trying to work out what would suit me best, and suddenly thought “why waste all this new knowledge”? So, as you browse through the reviews I have here, you will find all sorts of different microwaves that I think are worth a mention. I know that not everyone will read all the information we have, so let’s start with the most important reason most of you are here – our list of the very best microwaves you can get today. Hopefully you will also have a quick browse over the other topics, just to make sure you know the basics before you dive into the reviews. Ok, on to my top picks. It’s quite a mixed bag, but below is my selection of the best microwaves I’ve come across in my research. I’m sure you will be able to find something to your liking here. I always have budget in mind, and that’s why I recommend the Sharp 950 which is a very inexpensive over the range microwave that will suit people who don’t like lots of features (>> Full review). However, if you’re looking for a microwave like this that has a little more in the way of power and functions, feel free to take a look at the Sharp R-1880LS (review here) or the GE PVM9179SFSS (review here). If You Need a Microwave, and Fast! If you’ve skipped everything above, I completely understand. You’re probably looking for a microwave because you need to save time, so reading through a whole homepage isn’t exactly something you have time for right now. This is why I’ve put together this comparison table. 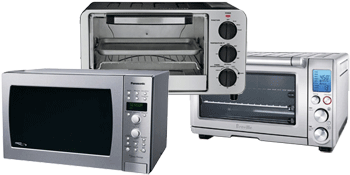 On this page, you will find all the models of microwave ovens I have reviewed for you. The only difference is that you will get the make, brand and best features the unit has to offer at a glance and if you like, I’ve also included a link at the end so you can read more about the oven you’re interested in so you don’t have to navigate around the whole website. For any of you who are looking for a microwave for the first time, or like me, it’s been a long time since you had the need to buy one this page of my website is going to be invaluable. There is so much technology out there these days it can get very confusing (believe me, I know), so here you will find everything you need to consider before reading the reviews and buying a new one. I recently had someone tell me that they have a microwave and they don’t even know what half of the features are (of course, I suggested they read the manual if they want to get the best from their microwave). So on this page of my website I’ve outlined some of the main features microwaves have so you can make an informed decision on what you need. I have also included reviews and information pages on toaster ovens, you can read these here. And if it’s convection ovens you’re interested in you should check out these mini reviews. Over the range microwaves are reviewed here, and I haven’t forgotten about those of you who might be looking for a range hood and separate microwave either. You can find my range hood reviews here and the microwave reviews, well, all over the website actually. Now for some more information which I think is pretty important. On this page I have outlined what you should NOT put in any type of oven that uses microwave technology and the reasons why. And if you’re like me and hate cleaning ovens, I also found a really easy cleaning tip which takes no time at all. I hope you enjoy this little creation and that you find the microwave that you’ve always wanted. I have done my best to give you nothing but good, honest and straight to the point information so your search will be far easier than mine was. Enjoy – your “microwave mad” friend Julia.